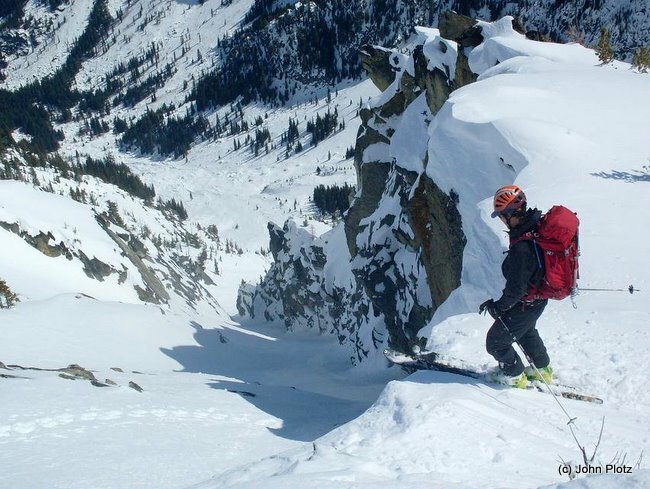 This ski touring season has been a struggle against inertia. Winter has been plagued with weather events that have rightly created a general paranoia about unstable snow layers. Decisions on whether to go out skiing have been shot down by that tiny voice that warns of impending doom. This has caused a critical buildup of internal frustration at not being able to split at the drop of a hat to ski something, which I’m accustomed to doing being a skier on the eastside. We usually don’t have that scepter of deep layer instability hanging over our light and dry snow. Thankfully, the weather improved just enough as of late to allow for some consistent rock climbing to stave off an all-out, adolescent meltdown. Spring has arrived, however reluctantly. At least it says so on the calendar. Our Leavenworth alps were provided a tiny glimpse of things to come last weekend on 4/22 and 4/23. My friend Dan Helmstadter and I have been impatiently watching the weather forecast ebb and flow the past several weeks, with hopes dashed just about every time once the Fridays roll around. Dan is on a more flexible schedule than I, and was able to squeeze in a mid-week descent of the NE Buttress of Chair Peak near Snoqualmie Pass recently. To put it in perspective, this is a popular and serious ice climb, and Dan just skied it, so he’s no stranger to keeping cool under highly pressurized descents. As they now say, it’s his “thing”. If you ski tour, then you are by default a weather hound. Holding true to form, we kept a close eye on the improving forecast for this past weekend, 4/22 to 4/23. Friday and Saturday looked to be the best days, and warmest for the year, in the Leavenworth area. To heighten the zeal, I had been spying an interesting line on Cannon Mountain, a couloir northeast of the well-traveled Cannon Mountain Couloir (CMC). The approach would have us ascend Rat Creek drainage, the mouth of which was still accessible despite the mud flow closure just upstream in the Icicle. A last look at the forecast on Thursday night was our confirmation for takeoff Friday morning, 3a.m. I’ve ascended Rat Creek before to access Cannon Mountain: Shooting The Cannon The previous time, with Tom Janisch and Kyle Flick, it went quite smoothly. Rumors of extreme duress and endless slide alder were dispelled with a nearly flawless ascent through open tiers of snow and larch and older pine. This time with Dan, it proved to be just as seamless. I felt none of the season’s bad vibes as we tromped over frozen snow, making quick work of the 5,700 vertical feet to the top of the NE Couloir. 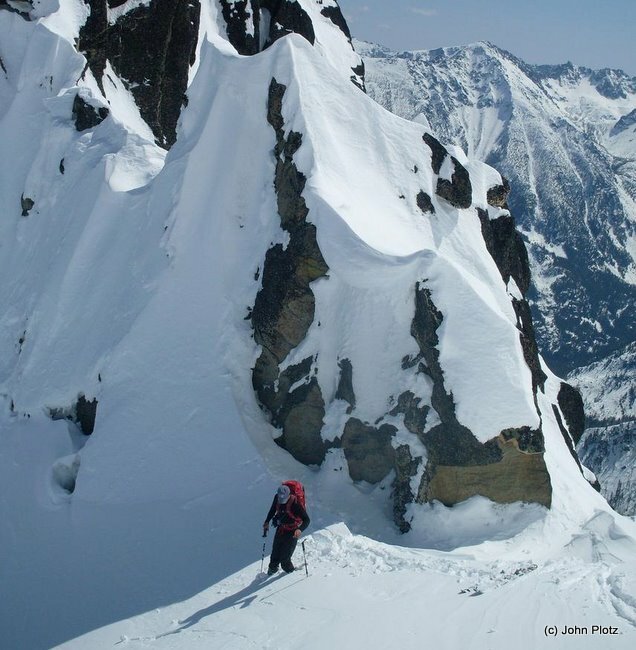 Once we crested its peak, we noted two skiers ascending the west slopes of Cannon, who we later learned were Leavenworth local and snow shredder, Aaron Scott and friend, gunning for the same gully. Dan and I were keeping one eye on the couloir, and the other on the clock, as we still had a long way to go to get to the Eightmile lake trailhead to bivy for the night. We transitioned from climbers to skiers, and made turns down the scenic couloir, the rock walls stained by yellow and red lichen that Dan likened to an impressionist painter. At its end, we donned our overnight packs and ascended the rest of Rat Creek drainage towards Coney Lake. From a small tier, we re-ascended the east slopes of Cannon for 1,700 vertical feet, reaching the top of the Cannon Mountain Couloir (CMC) by 3 p.m. By now it was painfully obvious I did not have my touring legs in shape, all this vertical gain and loss was a shock to my quads, hams, pinkies and overall cardio fitness. But from our vantage point on Cannon’s ridge crest, it was all downhill at least. Once more, we made turns in highly variable snow down the CMC, crossed over to the west slopes at the easiest point, and skied all the way down and across Mountaineer’s Creek 4,300 vertical feet after starting. Dinner was a welcome relief, for both of us. I have trained my body for day assaults in the mountains, and this extra pack weight for the overnight stay was not sitting well. Come morning, I was still reluctant to continue. I could feel several blisters, and my legs were protesting seemingly with each step. But Dan is a great salesman. He pointed out how we may not get another weather window such that we were experiencing, and we were in prime position to ski Mt. Cashmere. Of course he was right, but it took some hot and strong coffee for me to finally acquiesce and stuff my feet back into my ski boots. We skinned up the first 0.25 mile of the Eightmile Lake Trail, turning east as soon as we hit the Forest Service road. There are many ways to ascend the south side of Mt. Cashmere. In my experience, the easiest and quickest is finding what Andy Dappen coins the Goat Highway. I’m not sure if we found the goat’s equivalent to I-5, but we at least found Highway 97, as the path was easy to follow, with just the minimum of irritant brush and downfall. We felt more urgency today, as we knew the south slopes were going to be sun exposed by sun rays that were forecasted to be 10-degrees F warmer than Friday. Thankfully, there’s efficiency in familiarity, as I’ve traversed these slopes various times over the past few years. In no time we were skinning up the final gully towards the north basin notch just below Mt. Cashmere’s summit, 6,900 vertical feet from our camp. 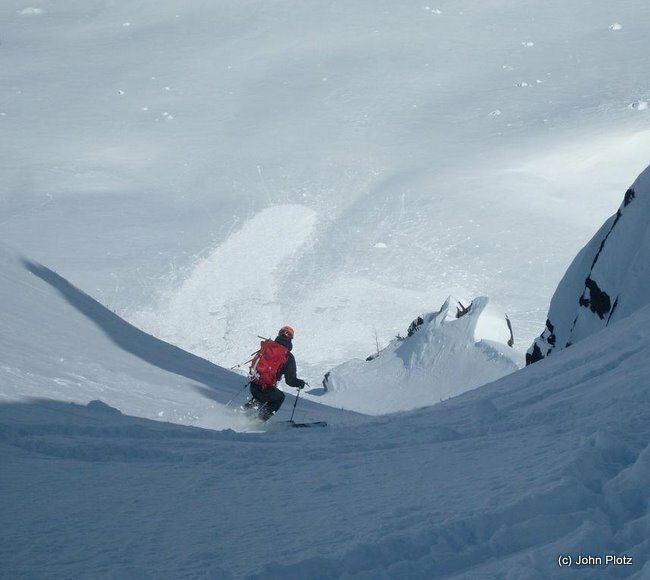 Dan implored that we ski the north couloir, even going so far as to hike down the upper part of it to prove that it was powder snow. I’m easily swayed by soft and cold snow, and soon enough we were making fun turns down into the wide-open north cirque. This descent was only about 700 feet, but very much worth the effort as we kicked steps back to the top. From there, we sprinted to the summit of Mt. Cashmere, where we stood on the rimed tip top, looking out over a dry eastern Washington. In haste, we descended back to the entrance of one of Mt. 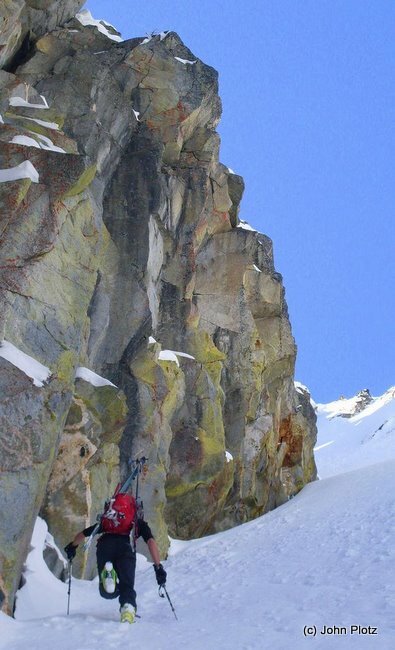 Cashmere’s south couloirs. 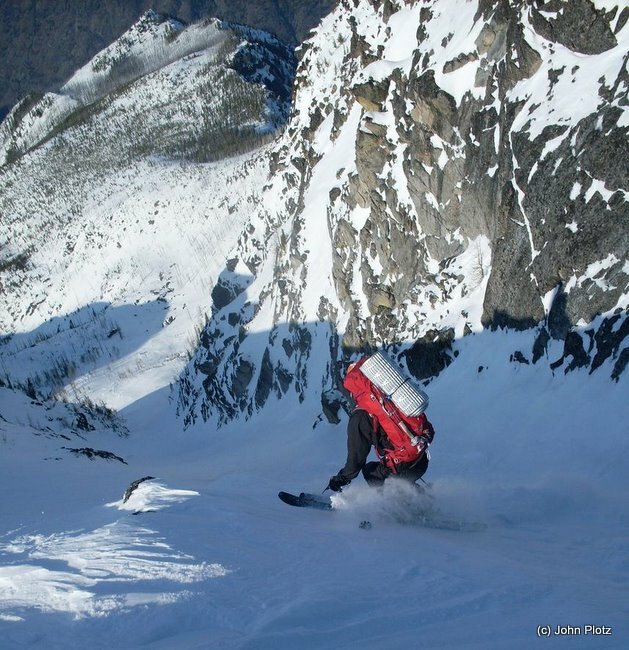 Dan is a purist, and clicked into his skis on the summit to ski from there. I, being of more sound mind, geared up on a flat space at the top of the couloir. By the time we were making turns and smiling uncontrollably, the sun had warmed the surface of the snow in the gully to corn perfection. Sure, there was a slough here and there, but nothing that wasn’t manageable. We reached the bottom of the couloir, and continued on to the mellow, rolling slopes of this wonderful peak. 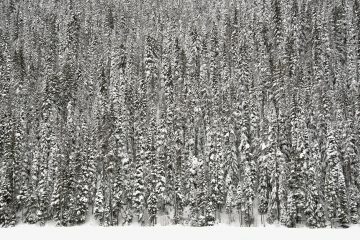 Advice: If you have aspirations to ski tour around our Leavenworth alps, then do yourself a favor and ski the south slopes of Mt. Cashmere in Spring. You won’t be disappointed. 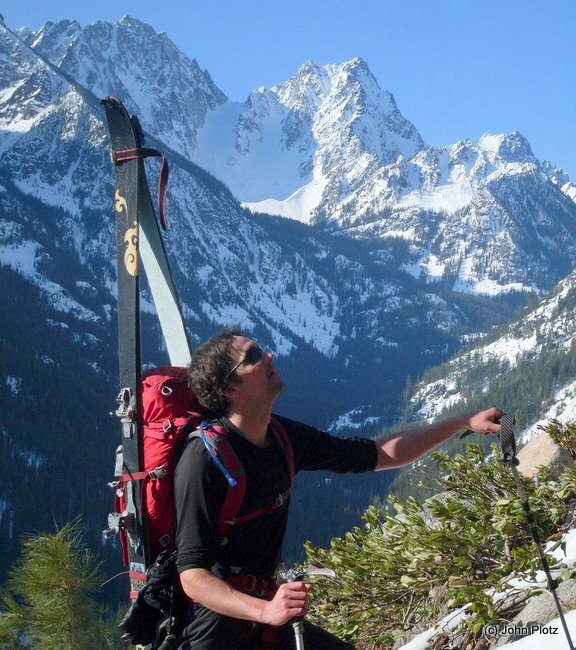 Dan and I laughed out loud at the perfection of it all: Sunshine, the “Marlboro backdrop” of the Enchantments, rolling hills of snow, the surface of which was melted just enough to allow for that magical synergy of mind-body-ski and nothing else. A season of anxiety and frustration melting away in the warm sun. This was truly the highlight of the two enchanted days. And we needed this “high”, because once it was all over, we were forced to walk 4 miles walk back to 8 Mile Campground. 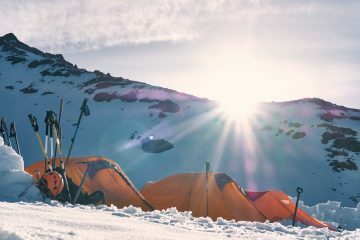 At one point, we walked by a group of climbers clad in shorts and T-shirts in the balmy weather, taking turns on Classic Crack. The incongruity of this scene made us laugh as we walked past them in our ski boots and Gore-Tex pants, skis strapped to our packs. Dan shuttled me back to my rig, where we shook hands and savored this excellent adventure in tired silence. We were also silently hoping that the last two days had finally helped us overcome the dark cloud this winter had cast on our ski season. Maybe this was just the bright momentum we needed to kick-start Washington’s true skiing season. This article was originally published on 4/30/2011.